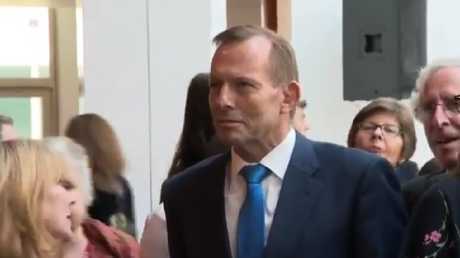 Tony Abbott awkwardly waiting to greet Julia Gillard. 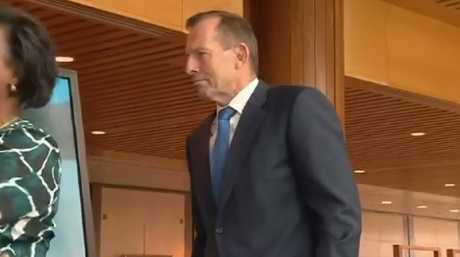 THERE'S awkward, and then there's Tony Abbott in this moment. 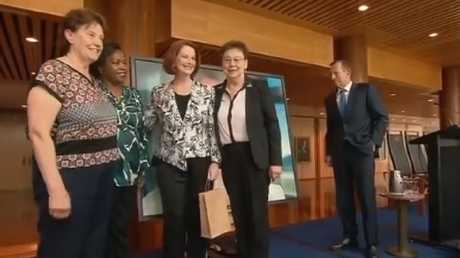 The former opposition leader was waiting in line to congratulate his former rival Julia Gillard at the official unveiling of her portrait at Parliament House today. 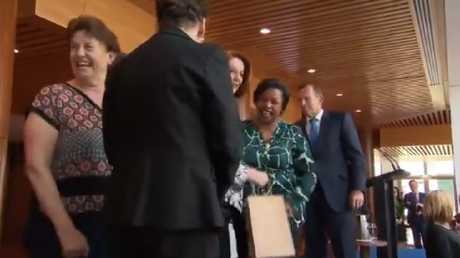 In a video shared to Twitter captioned "1 minute of Tony Abbott" which has already clocked more than 24,000 views, it shows him awkwardly forced to wait to greet the former prime minister as she took her time hugging and posing for photos with Parliament House cleaners Anna Jancevski, Luzia Borges and Maria Ljubic. He was in the front row during the unveiling. 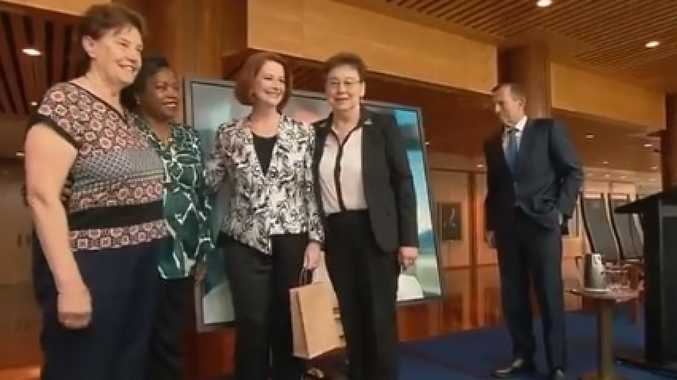 But Ms Gillard eventually extended her arm and shook hands with the man she once blasted (in 2012) in her now-famous speech on misogyny in reaction to his alleged sexism. She even gave him a shout-out in her speech. ... and still waiting while pulling off an impressive robotic stance. Props to him for remaining in that same position for an entire minute. 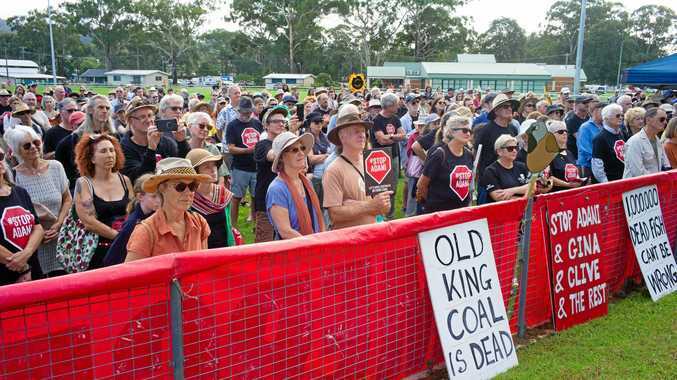 "There are too many here to acknowledge by name, but I would like to acknowledge former prime minister Tony Abbott for joining us and future prime minister Bill Shorten," she said. It has taken five years, when she was pushed out of the top job, to finally have her official portrait unveiled. "The portrait was on the list (to get done), I'd always say 'let's just forget about it'," she told the crowd in Canberra. "Finally there was a day when Nina, who works in my office, came to me ... and said 'You know, you ought to get that portrait done before you look a hell of a lot older than you did when you were prime minister'." Vincent Fantauzzo, whose wife Asher Keddie was in the crowd, painted the portrait. He said he wanted to capture Ms Gillard as "someone (who is) a game-changer, someone proud, humble and really passionate about Australians." 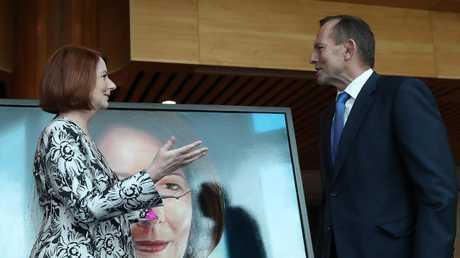 Ms Gillard said no painting could capture an entire prime ministership. "But I decided there was one story that this portrait could tell. It could tell the story that I was different from every prime minister that had come before," she said. 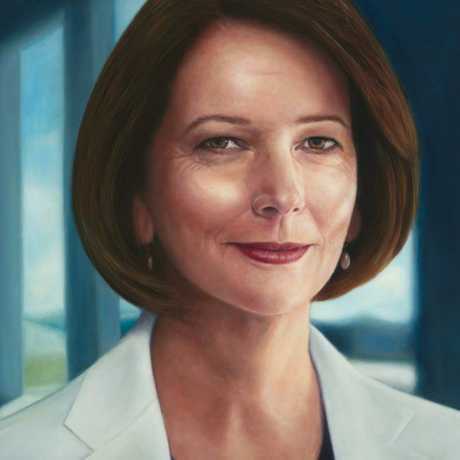 Former prime minister Julia Gillard's official portrait by artist Vincent Fantauzzo. "I was the first woman to serve in this role. "So I wanted the portrait to be visibly different to any other portrait that had gone before." Ms Gillard said when schoolchildren visit parliament in the future she wants them to notice how different the portrait is, AAP reported. "Then run their eye back up and think maybe it's because it's the first woman," she said. "And then maybe think to themselves 'Gee, it's kind of crazy it took that long for there to be the first woman prime minister'."